Driven by our Vision, as The Preferred Healthcare Provider, KPJ's main focus is to deliver safe care at all times at its more than 25 locations nationwide. 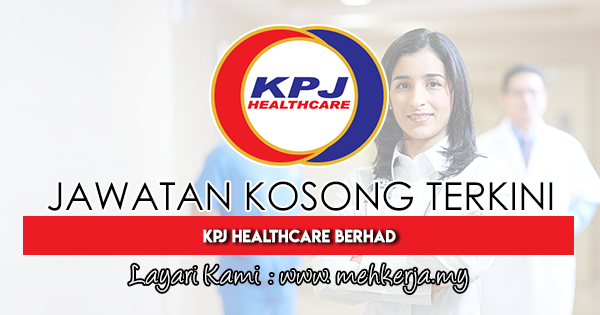 About Us KPJ Healthcare Berhad ('KPJ' or 'the Group') is Malaysia's leading provider of private healthcare services. Since its introduction of the first private specialist hospital in Johor in 1981, the Group has been at the forefront of the healthcare industry. Driven by its core values of Safety, Courtesy, Integrity, Professionalism and Continuous Improvement, KPJ's integrated network consists of more than 25 specialist hospitals located throughout the nation. With its expansion abroad, the Group currently has two hospitals in Indonesia, a sizable share in a hospital in Bangkok and a hospital in Bangladesh. In addition, KPJ has investments in a retirement and age-care resort in Australia and in Sibu, Sarawak, as well as its own Senior Living Care (SLC) centre in Tawakkal Health Centre (THC) in Kuala Lumpur. 0 Response to "Jawatan Kosong Terkini di KPJ Healthcare Berhad - 15 Feb 2019"